The Digital Camp Crystal Lake Cabin Retreat and Interactive Dev Diary is an add-on feature that can be purchased as part of the Slasher Backer campaign for $15. The cabin is a fully immersive experience that lets fans have access to all of the on-going development for Friday The 13th: The Game, which are represented by and broken into cabin rooms that feature the weapons used in the game, versions of Jason from the films, and other relevant items. While fans are touring inside the cabin, they should take a long look out of the windows as they will be greeted by some fun surprises. The interactive cabin debuted a few weeks ago and made a lot of fans very excited. 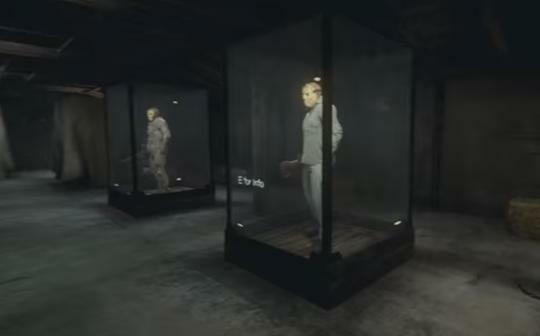 Just a few days ago, the cabin access expanded for users to explore the Jason room which allows fans to see the different versions of Jason Voorhees that will appear in the game. That isn't the only new thing to see in the cabin as people who are touring can now view transcripts of Pamela's Tapes which is something Jason Lives director Tom Mcloughlin was brought onto the project to contribute. There are also a number of other new additions that include answering the rotary phone and witnessing the mattress that Sandra and Jeff die on in Friday The 13th Part 2! Both experiences are the beginning of unlocking something even greater within the cabin in the weeks to come. Stay tuned for that. Watch the excellent video review below to see all of the new easter eggs and the brand new Jason room, courtesy Youtube channel CharminEXSoft Gaming.